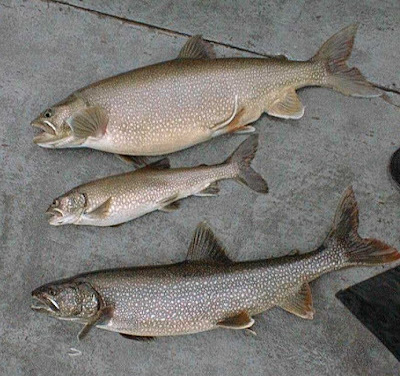 The Lake Trout or Salvelinus namaycush is one of the most popular Trout species and is renowned for its fine flavor. This freshwater fish is found in many deep lakes in the northern parts of North America including the Great Lakes. Lake Trout go by many different names depending on where you are, these include Salmon Trout, Mackinaw, Lake Charr, Touladi, Togue, Grey Trou, Siscowet, Paperbellies and Leans. These fish can reach weights exceeding 100lbs, but they rarely reach these sizes, because Lake Trout are slow growers that don't reach sexual maturity until about 6 years old, living to over 25 years old. They have two dorsal fins and light spots on their dark gray bodies. 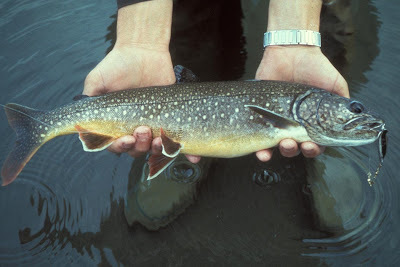 The Lake Trout's lower fins have white on their edges. You can check out a large Lake Trout in the video below..